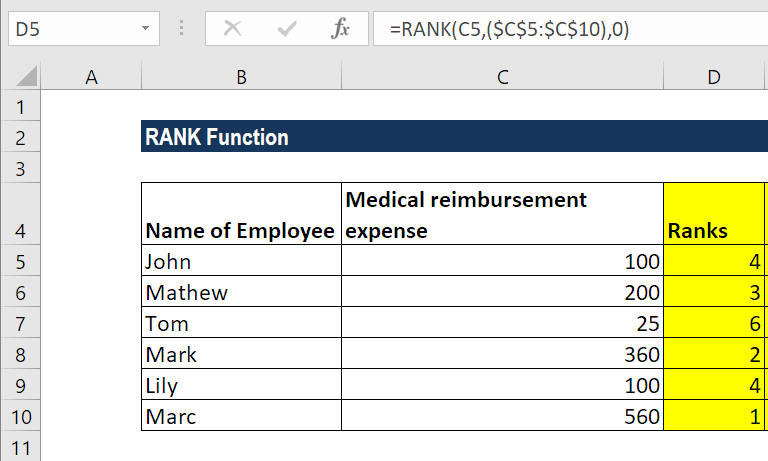 The RANK Function is categorized as a Statistical functionFunctionsList of the most important Excel functions for financial analysts. This cheat sheet covers 100s of functions that are critical to know as an Excel analyst. The function returns the statistical rank of a given value within a supplied array of value. Thus, it determines the position of a value in an array. Number (required argument) – It is the value for which we need to find the rank. Order (optional argument) – It is a number that specifies how the ranking will be done (ascending or descending order). If we omit the argument, it will take a default value of 0 (descending order). It will take any non-zero value as the value 1 (ascending order). Before we proceed, we need to know that the RANK function’s been replaced by RANK.EQ and RANK.AVG. To enable backward compatibility, RANK still works in Excel 2016 (latest version), but it may not be available in future. 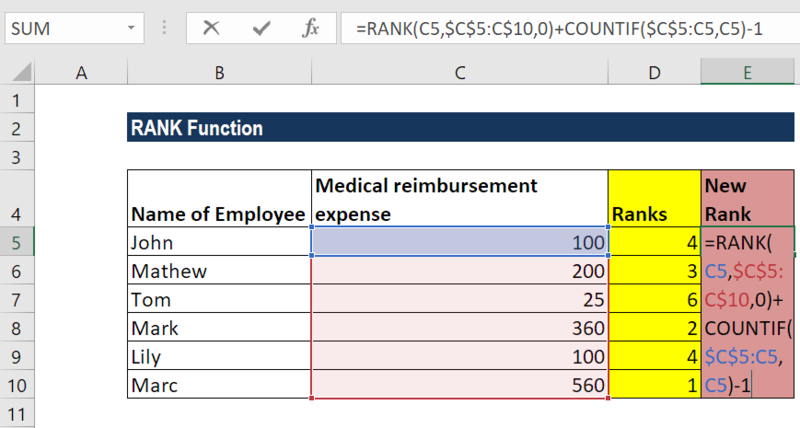 If you type this function in Excel 2016, it will show a yellow triangle with an exclamation point. 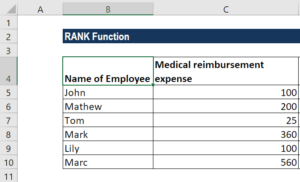 How to use the RANK Function in Excel? Assuming we are given a list of employees with their respective medical reimbursement expenses. We wish to rank them according to total expenditure. As seen above, the RANK function gives duplicate numbers the same rank. However, the presence of duplicate numbers affects the ranks of subsequent numbers. For example, as shown above, in a list of integers sorted in ascending order, the number 100 appears twice with a rank of 4. The next value (25) will be ranked 6 (no number will be ranked 5). In both formulas, it’s the COUNTIF function that does the trick. We used COUNTIF to find out the number of times the number occurred that was ranked. In COUNTIF formula, the range consists of a single cell ($C$5:C5). As we locked only the first reference ($C$5), the last relative reference (C5) changes based on the row where the formula is copied. Thus, for row 7, the range expands to $C$5:C10, and the value in C10 is compared to each of the above cells. Thus, for all unique values and first occurrences of duplicate values, COUNTIF returns 1; and we subtract 1 at the end of the formula to restore the original rank. For ranks occurring the second time, COUNTIF returns 2. By subtracting 1, we increased the rank by 1 point, thus preventing duplicates. If there happen to be 3 plus occurrences of the same value, COUNTIF()-1 would add 2 to their ranking, and so on. #N/A! error – Occurs when the given number is not present in the supplied reference. Also, the RANK function does not recognize text representations of numbers as numeric values, so we will also get the #N/A error if the values in the supplied ref array are text values. If we provide logical values, we will get the #VALUE! error.